Joan Schuman: As I mention in the fall 2018 Earlid introduction, Jenny Erpenbeck’s novel, Visitation, is pretty intense. It made you gasp, it seems, too. I was exploring my notes after I read it the first time and there’s so much resonance between her book and your ‘episodes’ of Strange Radio and, in particular, of parts 1 and 2 of Haus. Hers offers episodic stories around one German lake house across inhabitants and, more pointedly, spanning the 20th-century’s most haunting of catastrophes. She conflates these eras and begins and ends the book with echoes of collapse. There’s a caretaker/gardener that reminds me of your role as a kind of caretaker of the stories in your family’s Viennese apartment building. What was it like to arrive and look upon this house, to listen to its current space (and residents), after so much imagining—across your own childhood? Does the house function like a text that you’ve read and re-read, had ‘read’ to you by family members, perhaps interpreted? Karen Werner: I had not heard about this house growing up actually, more so Vienna generally was romanticized and spoken of, a place that had an elevated air to it, full of stories, laughter and characters I would never meet. Vienna was very much still in my parents. We stood outside the building on Novaragasse and looked up at this large building just taking it in. And then we did the same thing a decade later when I was on an art residency in Vienna in 2016. Again I recorded my mother finding the house, this time walking in a shuffle with a cane from age, and we stood outside the building not even bothering to ring the buzzers. It’s like our own version of Kafka’s parable, Before the Law. I remember people walked out of the building and we were these confused spirits staring at them. It seemed so enormous to conceive of getting inside the house ever. It seemed right to stand outside the front door. Joan: So how did you end up going through the door? who owns one of the apartments. Hermine did a lot of research about what happened to the house during World War II and who was deported from there, even from which apartment. Hermine is someone I now feel very connected to. Georg Salner also introduced me to the young couple in my family’s former apartment, Number 20. On the stairs during my first visit to the house I met the musician Elisabeth Kelvin who lives on the third floor who I later asked to perform the klezmer circus music in Haus. I spent a lot of afternoons and evenings in the house having tea and wine and cake with these people who have become friends. After one such visit I sat on the dark stairs around midnight and chanted Kabbalistic permutations, which I recorded. This was a powerful experience and the recordings are in Haus part 1. Joan: Did that lead to the performances in the hallways of Novaragasse? 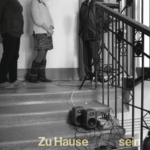 Karen: With Georg Salner’s blessing I started bringing in artists to perform in the staircase and hallways for the circus and I audio recorded these events, once even brought in a fabulous sound engineer from ORF to record the aerial antenna artist Reni Hofmüller. 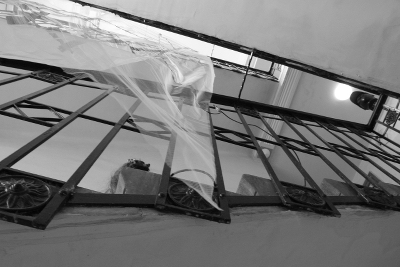 That was a stunningly powerful experience when Reni draped her mesh-sewn antenna fabric down the center of the staircase, like it was dividing the space into past and present and we listened together to the inaudible past mixing with the audible mundane living of the house. Georg Weckwerth later organized a walking tour event in the house where people, including residents, would learn the history of the house and walk together to the nearby gallery where Haus was playing. Residents of the house got to know each other through this event. In a way it was hilarious and bold to bring in performers to record in the hallways and staircase. I found I could claim the hallways and stairs in the building as a sort of home. So in a way I was still outside but on the inside, too. The word ‘stranger’ shares a Latin root with ‘extraneous,’ being external to. I am intrigued by this spatial position, it feels right to keep the tension between outside and inside of this place. In this strange inside-outside space I have been able, through Haus, to create a circle, a word that has the same root as circus. The many people who have joined me in this circle/circus, whether as ghosts and memories, circus performers, inhabitants of the house or as listeners now, are part of this piece and experience. Joan: Oh, you’re like the ghost of the present, lingering in the hallway, up and down the stairs, in between the railings! That’s intriguing that you deem it hilarious ‘and’ bold, when it seems a reclaiming in any instance is more a conjoining of plucky, spirited, confident, feisty. All these monikers fit. When we sit for a seance, we conjure these elements in order to receive what is ‘sent’ to us. 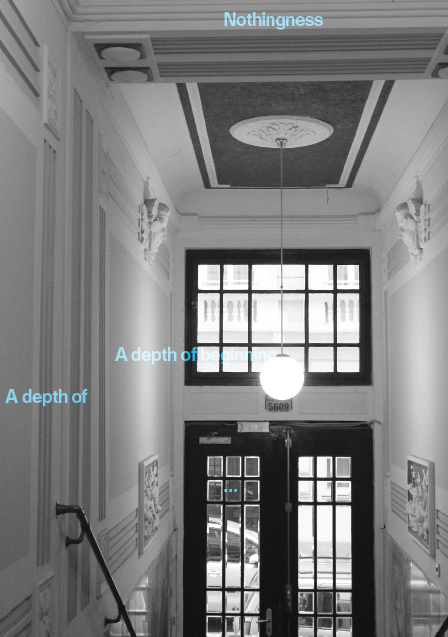 In both parts of Haus, you invite our ears towards the possibilities of what was once going on in this building. Joan: Haus (part 1, Covenant of the Tongue) feels like poetry or mantra or spirit song; Zirkus, like a celebration we’re eavesdropping on (things going on in the hallway always have that feeling from behind our closed doors). And yet both are dancing around themes of grief and repair. You’re working with chance (the Kabbalah), with the vibration of letters as they ignite into meaning. In Erpenbeck, one of her characters, an architect, muses on the idea of home and how a house is your third skin (after flesh and clothing). These draw us towards the outside and the inside, the disembodied and the unknown. I wonder how you see these elements in Haus, and how you’ve presented them across media? These works air on radio, a ghostly, disembodied entity, as much as they are ‘broadcast’ into real space and are performed. How did you land upon these spatial elements? Or were they organically considered as you began to absorb the space and the collection of voices? Karen: Home is often thought of as a private space, a space of eating together, talking about one’s day, taking care of family, making love, arguing, being our most real ideally. A space of mundane domestic sounds, plates being put away, a door closing or opening, faucets and toilets and the fridge and a phone call. Belonging, this longing to be with. And going back to this idea of it feeling hilarious and bold to be recording a circus and spirit song inside a house where I am an interloper on the stairs…I think that’s what I was trying to do. The house is not private, it’s public space too in that it is inflected and infected with history and social and broader power dynamics. We may think we can close a door to the outer world but we can’t. Maybe this means we bring our inner world into the outside world, too. And this connects to your question about media, broadcast and space. 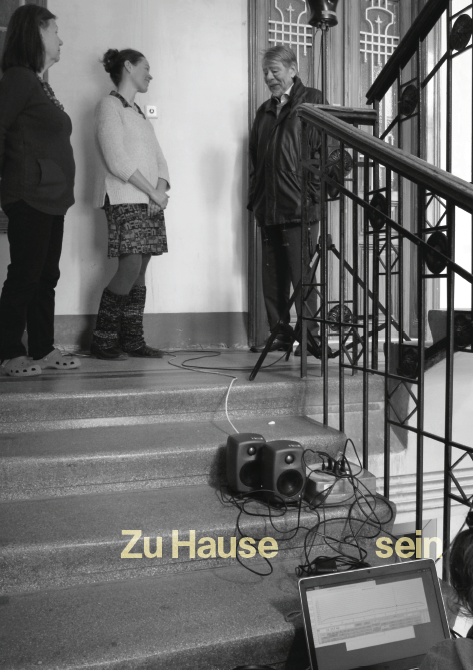 I initially made Haus 1 and 2 as sound installations. In the case of Haus 1: Covenant of the Tongue, I was making it for a public passageway in Vienna’s MuseumsQuartier (MQ). A passageway is such an interesting space for being both inside and outside, it’s between space, a space to move through, a liminal space. I spent a lot of time observing how people move through this passageway in Vienna. I had a view of it from my window at MQ where I stayed that month while making the piece. People walk quickly though the passageway and I wondered how I could grab their attention, draw them in. 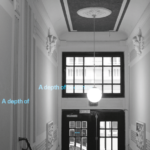 I worked with the reverberating arched ceiling, the eight speakers, and seven photos of the stairs and hallways of the haus with words from the Sefer Yetzirah superimposed. I wanted something beautiful—the human voice—intimate, raw, singing. 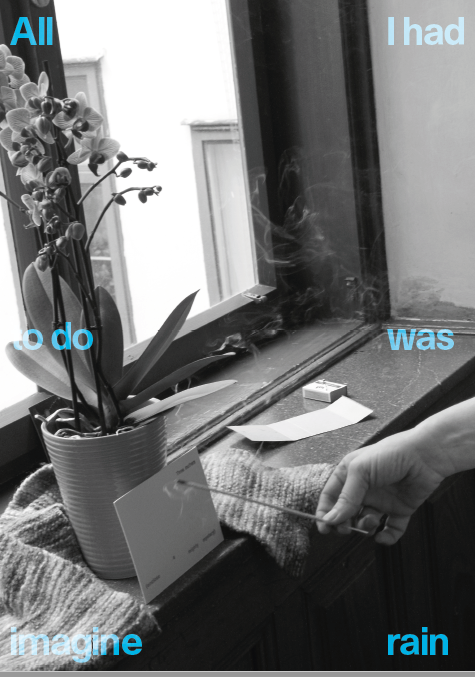 I wanted this family house to be public and this public history to be intimate. Though Haus 2: Zirkus was also initially made as a sound installation, I was thinking of this piece living more in the imaginative theater of radio space. I aimed to create a three dimensional sonic space. You hear the sound waves within the space and walls, so the haus becomes a character in that sense. Karen: I’m interested that you said you feel like you are eavesdropping on the circus. There is a stand-in listener within the piece, someone who enters the building, whose steps we hear on the stairs and stands next to others clapping; then this listener leaves at the end, closing the haus door behind them. But you and even me as listener are not the same as this invisible witness inside the piece. We are hovering somewhere groundless. Are we the ghosts? Joan: That’s what makes Zirkus have all these aspects—part seance, part exorcism, part documentary. Whenever I think of a circus, I think of how it’s comprised of creatures who leave society (or are pushed out of it). So there, too, is another connotation, about your own and others casting about in the halls and stairwells of the house on Novaragasse. 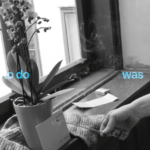 Joan: The writer Erpenbeck invites a suggestion of ‘collapse’ in her story, which I don’t find so much in Haus as the apartment building stridently remains (to tell its own stories over time to you as its collector). You, on the other hand, have stepped inside—venturing in liminal ways, as you say. It’s like you’re a ‘curator’ of the many stories this house has told, the micro-collapses along the way. By comparison to all these ‘dark’ stories like in Erpenbeck’s text, your artistry fluidly captures this darkness and transforms it. Not so much ‘light’ vs. ‘dark’ but this sense of a flow of feeling (from the tongue and the palate and these places that form the unspeakable to the circus in the stairwell, a kind of joyful celebration and the floating aerial antenna). Karen: Transformation is a key motivation. But is there such a thing, is transformation a human delusion, a way of making meaning from violence and profound cruelty? The way to heal, to reclaim control, to become able to co-create meaning in the world? Who is transformed? Who is served by this transformation? A quote from sociologist Avery Gordon has stayed with me while researching and making Haus. She writes about the power of going through an arduous bodily ordeal in the context of justice. The chanting and letter permutations I did many nights, often starting at 2 a.m. at top volume in my room at the MQ, were part of the experience of making Haus 1: Covenant of the Tongue, as was weeping and going to the house a lot, meeting people there. I wanted to use my body to eliminate the system’s nastiness. And something met me for the first time in a creative project. Things emerged in the sound piece that I had not controlled or intended. The various encounters and strange late nights helped my self get out of the way.